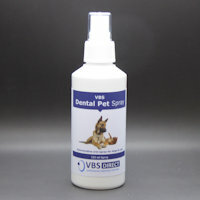 VBS Direct Ltd - VBS Dental Max Spray - Innovative solutions for the veterinary professional. This product is a mouthwash for dogs and cats. Its alcohol-free formulation and active ingredients have many beneficial effects on teeth and oral cavity health. Chlorhexidine is an antibacterial substance that acts by direct contact preventing bacterial growth and inhibiting dental plaque build-up. Mallow and Ginkgo extracts enhance natural defences and have a stimulating and soothing action on gums. Trioxyethylrutin is a bioflavonoid that helps strengthening gums microcirculation. Sodium Fluoride protects teeth, reinforcing the enamel’s strength. Apply daily by spraying directly onto teeth and gums, or spray onto a cloth prior to applying evenly. It is suggested to use for cycles not longer than 21 days which can be repeated several times, according to your veterinarian's advice.